The four 15 W TDP processors will run at slower base clock rates and with the same integrated 620 Graphics as the 7th generation Kaby Lake equivalents. Regardless, the move to four cores and eight threads promises a significant 40 percent performance boost without sacrificing battery life. 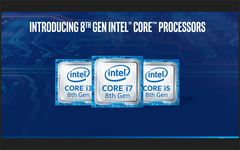 Intel has pretty much confirmed previous rumors. 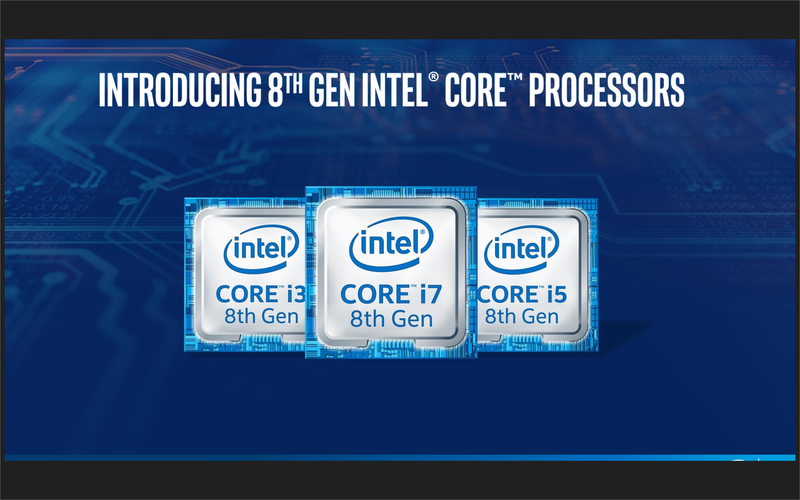 The upcoming 8th generation Core ix family will include both 10 nm and 14 nm processors from both Kaby Lake and Coffee Lake microarchitectures. The generational gap will no longer be defined by the processor design but by the claimed performance boosts over the previous generation. 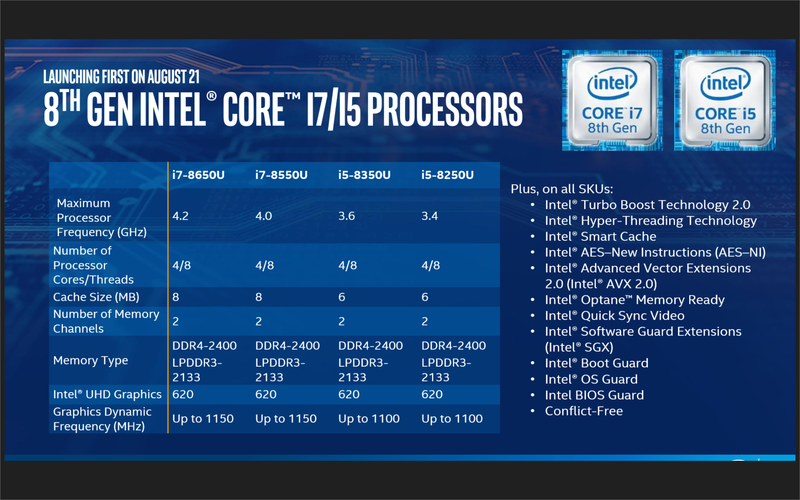 The first four 8th generation SKUs debuting today will be the Kaby Lake-R quad-core i5-8250U, i5-8350U, i7-8550U, and i7-8650U to replace the Kaby Lake dual-core i5-7200U, i5-7300U, i7-7500U, and i7-7600U, respectively, as detailed by the table below. By doubling the number of cores and further optimizing the Kaby Lake architecture, Intel is claiming a 40 percent raw CPU performance boost over the 7th generation. We've previously stated that Intel would have had to dramatically decrease the base clock rate for any potential quad-core U-class processor should they wish to remain within the 15 W TDP envelope. This has turned out true as the new quad-core Kaby Lake-R CPUs will run almost a full GHz slower than the equivalent dual-core Kaby Lake. The i5-8250U, for example, will run at just 1.6 GHz base compared to the 2.5 GHz i7-7200U found on most current Ultrabooks. This is perhaps the biggest reason why the chipmaker excluded any base clock rate data from the presentation slides for press. 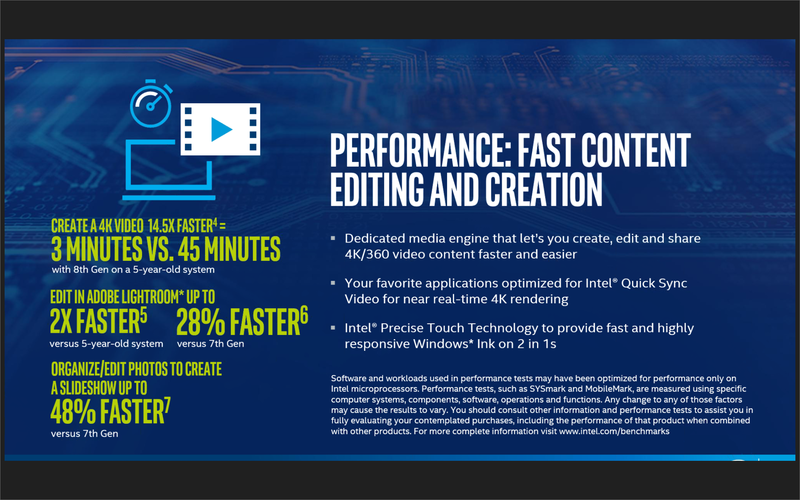 Intel is simultaneously promising faster Turbo Boost clock rates as well, but we certainly have our doubts on Turbo Boost sustainability judging by the recent Surface Pro revelations. The jump from 7th gen Kaby Lake to 8th gen Kaby Lake-R focuses on improving processor performance more so than integrated GPU performance. This is in stark contrast to the jump from 5th gen Broadwell or 6th gen Skylake to 7th gen Kaby Lake where the increase in CPU performance was more incremental compared to the GPU side. 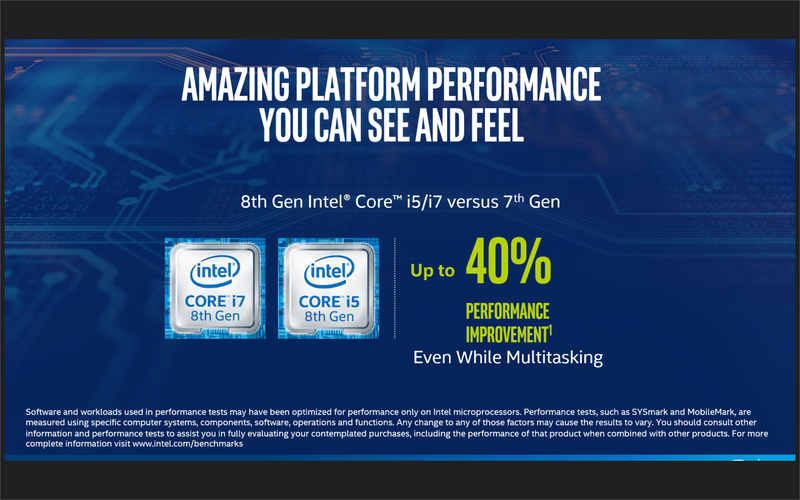 The four new Kaby Lake-R processors will utilize the same HD Graphics 620 as the current Kaby Lake family even down to the clock rates and number of rendering pipelines. Thus, the name change to "UHD Graphics 620" is simply a moniker to reflect the industry trend of pushing UHD monitors, UHD graphics, and UHD streaming. 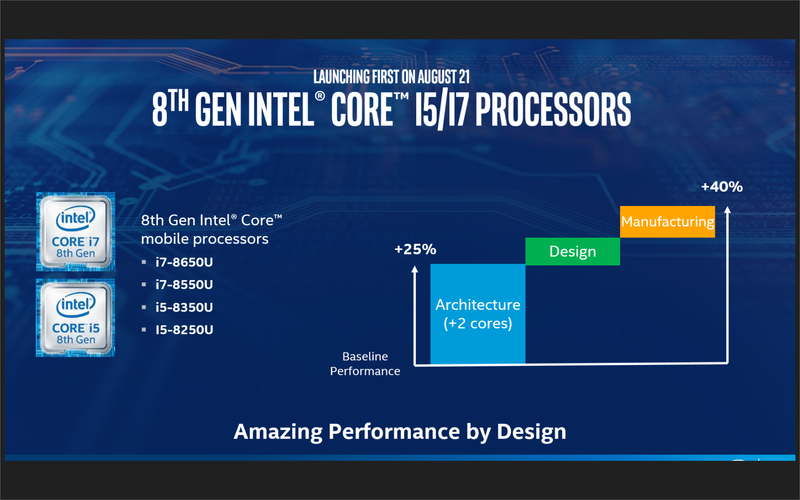 This is reason enough for enthusiasts to refer to the U-class Kaby Lake-R processors as a half-step "7.5 gen" as opposed to the "proper" 8th gen Coffee Lake design rumored to include hexa-core H-class CPUs. As for processors outside of the four U-series SKUs mentioned here, details on the eventual 4.5 W Y-series, 45 W H-series, and 35 W to 95+ W desktop S-series will follow in the Fall. 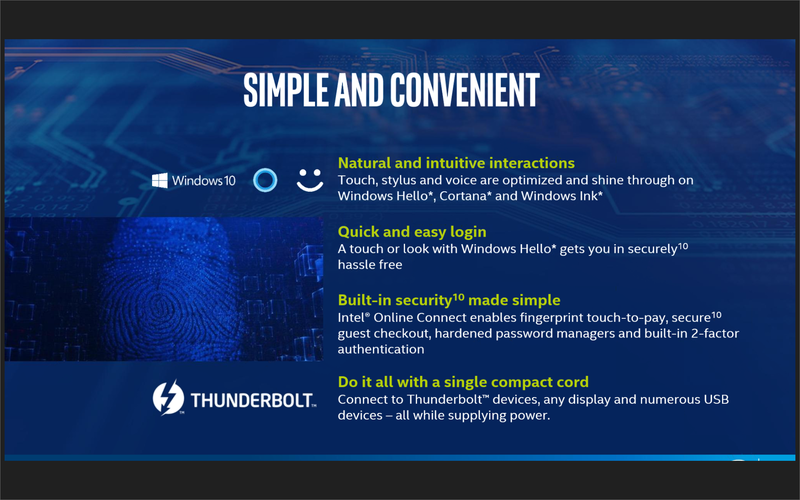 More concrete Coffee Lake news will be coming later today via Intel's public web event. We should be hearing about plenty of new notebooks and convertibles utilizing Intel's 8th generation U-class chips come IFA 2017 for a launch next month. The XPS 9360 update and Yoga 920, for example, are expected to be made official soon. Clevo was kind enough to provide us preliminary CineBench R15 benchmark data on the quad-core i5-8250U and i7-8550U as shown below. As expected, single-thread performance will see no significant gains since Kaby Lake-R is fundamentally the same processor as the outgoing 7th generation Core family. Multi-core performance, however, shows a massive 45 to 60 percent improvement over the common dual-core i5-7200U and i7-7500U. The fact that even the 45 W Core i5-7300HQ found on many gaming notebooks is beginning to fall behind shows how large of a gap the 8th generation Core family will bring to the table. As impressive as it this may be, the provided scores from Clevo should be taken with a grain of salt as Turbo Boost performance will depend heavily on the manufacturer and cooling solution.